Each page is available as a black & white student reproducible as well as in full color! 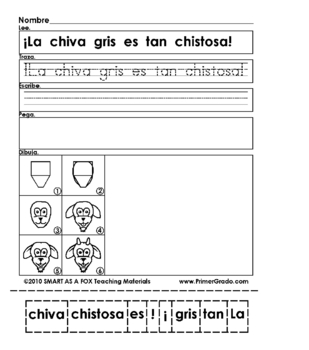 The color pages allow the teacher or student to follow along with even greater ease. The newest steps are always highlighted in red. 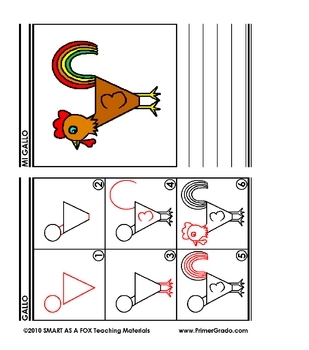 This title will teach you how to draw the following farm animals: cat, dog, cow, goat, rat, sheep, rooster, duck, chick, and more. BONUS! 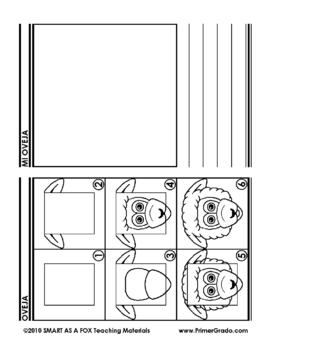 For each animal, there is a cut & paste activity with sentences containing essential sight words. Example: "Mira la vaca cafe." "¿Te gusta mi ratoncito?." "El pato blanco esta nadando." 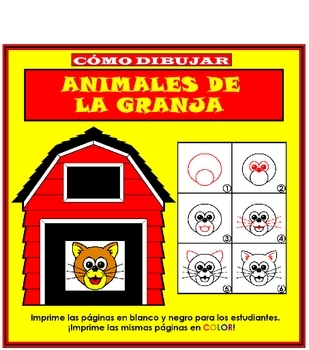 Este ti­tulo le ensenara a dibujar los siguientes animales: gato, peroo, vaca, puerco, chiva, pollito, gallo, y mas. ¡EXTRA! Para cada animal hay una pagina con actividades de cortar y pegar, escribir, y leer con oraciones que contienen palabras esenciales. Por ejemplo: "Mira la vaca cafe." "¿Te gusta mi ratoncito?." "El pato blanco esta nadando."